When thinking of the term “blunt instrument,” the image of a sledge hammer comes to mind. The effect of a sledge hammer is a large impact, and an indiscriminate one, which means it can have an effect beyond its intended target. As Fed Chairman Powell reiterated on Wednesday, the Fed Funds rate is the Fed’s main tool of monetary policy. The Fed Funds rate is a blunt instrument. When the Fed changes the rate, it may intend to constrain some parts of the U.S. economy, but other parts will inevitably feel an impact. In addition, changes in the Fed Funds rate produce effects around the globe. A change in interest rates affects both borrowers and savers. When rates rise, borrowers pay a higher cost for money while savers receive more income for lending money. But orthodox economic theory asserts that a rise in rates will constrain the economy while a reduction in rates will stimulate the economy. So orthodox economic theory (and the Fed) is clearly focused on changing the behavior of borrowers, not lenders. That’s why you never hear an economist saying that an increase in rates will stimulate savers into greater economic production or that a reduction in rates will constrain savers from spending more. The U.S. government is the best example of a consistent deficit operator. The Fed’s rate hikes are harming the finances of the U.S. government, because it will issue somewhere near $1 trillion in debt this year. As its pile of outstanding debt increases, so does its commitments to pay interest. The rise in interest rates only aggravates that problem. However, if the Fed is correct that the economy is growing strongly, then federal tax receipts will increase, which may partially or fully offset the increase in interest expense. As Powell said repeatedly during the last FOMC press conference, there is high uncertainty around any prediction, simply because there are very few times in history when large budget deficits and large changes in tax policy coincided with persistently rising interest rates and a looming trade war. Regardless of the net effect of interest rates and GDP growth on the U.S. budget, orthodox economic theory assumes that the Fed can monetize U.S. federal debt (which it did during QE), meaning that a rise in interest rates won’t have much impact on the government’s desire to borrow. The open question is whether investors will satisfy the government’s desire to borrow, and if so, at what rate of interest, which cannot be known in advance. Moving from government to corporate finance, the Fed’s policy targets the 34% of the Russell 2000 index of small public companies that does not operate at a profit. The percentage ranged between 28% and 36% in recent years since peaking at 44% in 2009. Perhaps more surprising is the pervasive lack of profitability during one of the longest business expansions in U.S. history. The recent corporate tax cut is useless for these companies, because if they don’t have profits, their income tax rate is already 0%. Some believe the Fed’s zero-interest rate policy (ZIRP) is a major reason why many unprofitable companies are still in existence. Whether an unprofitable company is publicly or privately owned, operating losses must be funded by either issuing debt or equity. If the cost of debt is increasing, it is a clear negative for companies that must borrow to fund their operating losses. The Fed is targeting companies that chose to borrow at short-term interest rates, even if it is difficult to identify exactly which companies they are. However, it is not difficult to identify the motivation. Short-term interest rates were pressed to the floor by the Fed’s 8-year experiment with ZIRP. In addition, short-term rates have been persistently lower than long-term rates by 2-3% for most of the past decade. At a minimum, it has been a tempting period to borrow at short-term interest rates and save on interest expense. Investors oblige that temptation, by investing in mutual funds that lend to companies in the leveraged loan market. Leveraged loans have a floating-rate coupon that adjusts to changes in short-term interest rates. 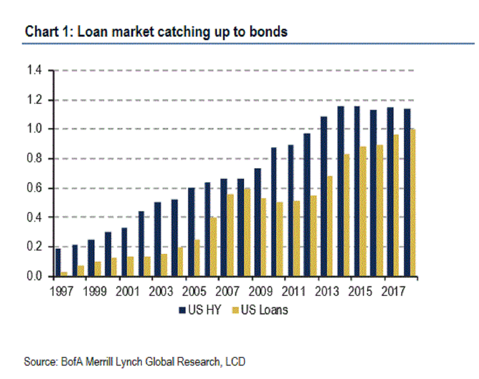 The market for leveraged loans has doubled since 2012, as shown below, and is nearing the size of the U.S. junk bond market, as it last did in 2007 and 2008. From the investor’s perspective, leveraged loans and their floating rate coupons are a hedge against the risk of rising interest rates. That hedge seems sound, but if the borrower’s business model is based on borrowing at low interest rates, an investor in leveraged loans during a period of rising rates is simply exchanging interest rate risk for credit risk. Given the rapid growth in leveraged loans, and Wall Street’s appetite for generating fees from underwriting securities that aren’t what they appear to be, it is doubtful that investors understand that exchange. By hiking rates, the Fed is targeting entities that have issued debt in the past at lower interest rates than exist today or will exist in the future. The U.S. government, as the largest issuer of outstanding debt, will face this problem as its bonds mature. Beyond the government, speculative-grade companies that borrow in the junk bond market are also exposed to this risk because they typically borrow at a fixed-rate for 3-10 years. As their bonds mature, they must refinance the bonds at the prevailing interest rate, which will probably be higher than it was in the past. The chart below shows how many junk bonds (blue bars) will mature in coming years. In aggregate, companies may not have too much trouble refinancing their maturing junk bonds in 2018. But the amount of maturing junk bonds will increase rapidly in future years, which coincides with mushrooming U.S. government borrowing. Leveraged loan maturities (green bars) will also accelerate during the same period. A final group of targets of the Fed’s policy to raise interest rates is any borrower that finances large capital investments. An obvious target is the real estate sector, which accounts for 5% of GDP, plus asset values of $25 trillion for residences and another $12 trillion for commercial property. Individuals and real estate developers are both highly-leveraged because they borrow 70-80%, or even more, of the money to purchase or develop residences and commercial properties. For highly-leveraged borrowers, small changes in interest rates make a big difference in economic reality. The good news is that 90-95% of mortgages used to purchase primary residences are fixed-rate loans in recent years, as shown below. In contrast, during the housing boom, creative financing was used to purchase almost half of all residences, which is another way of saying that people who couldn’t afford a home were able to buy one. So it doesn’t appear that a rise in interest rates will directly impair many existing homeowner’s ability to pay their mortgage. But the bad news is that rising rates will increase the cost of ownership for homeowners and developers in future purchases, which should reduce real estate activity in coming years. The effect on real estate prices will depend on local supply/demand conditions, and whether the Fed is correct that the risk of an outbreak of inflation is nigh. Other capital-intensive sectors include the auto, energy, transportation, and communications industries. Auto companies must continuously invest in machines that make autos, and individuals borrow money to purchase autos. So higher rates constrain both the producer and the consumer in the auto market. Exploration for oil requires large investments in capital goods to extract it and transport it to the places where it is refined and consumed. As detailed in a previous article, since 1970, during periods in which the price of oil doubled and the Fed Funds rate rose by more than 2%, a recession has followed 100% of the time, and with no false signals (LINK). The transportation industry requires the purchase and maintenance of planes, trains, and trucks. Communications companies must continue to invest in infrastructure to keep up with the pace of change, which only seems to increase. In each of these sectors, the Fed is raising rates and targeting a lower level of activity, which means a lower level of GDP. The broad industrial sector, which produces components for the above industries, is the sector most highly correlated with the direction of the S&P 500 index. As analyzed here (LINK), the industrials sector has been underperforming for more than six months. Manipulating the Fed Funds rate is an attempt to manipulate the behavior of borrowers, not lenders. The Fed states that the U.S. economy is very strong and appears to be fearful that it will grow even stronger. In response, the Fed is increasing the Fed Funds rate to increase the cost of borrowing. Solvent, profitable entities will not be financially imperiled by increases in the Fed Funds rate. But borrowers with any of the following characteristics will be challenged. Borrowers with more than one of the following characteristics will be particularly challenged. Operating at a Loss/Deficit: The largest borrower, the U.S. government, will probably not change its borrowing habits because in an emergency, the Fed could step in and buy Treasury bonds, just as it did during the QE era. However, companies that operate at a loss, which comprise 1/3 of the Russell 2000 index, will not be so lucky. The costs for borrowing to finance their deficits will rise. Chose To Borrow at Short Term Rates: Speculative-grade borrowers in the leveraged loan market are exposed to a rise in rates, they issued debt in floating-rate coupons, which are rising. By definition, speculative-grade companies are highly leveraged, meaning that a rise in costs will threaten their finances. Investors who flooded into the leveraged loan market will find that they hedged their interest rate risk but increased their credit risk. Must Refinance Maturing Debt at Higher Rates: Entities that issued debt in the past and must replace maturing debt with new debt will probably have to do so at higher interest rates. The U.S. government faces this problem, but the Fed will probably act to minimize it. Junk bond issuers are particularly vulnerable to rising rates because interest expense is a large expenditure for highly-leveraged companies, and junk bond maturities will increase in coming years. Operate in Capital-Intensive Industries: Activity in capital-intensive industries such as the auto, energy, transportation, communications, and industrial sectors will be negatively affected by an increase in the cost of financing. In the auto industry, customers will also be facing higher interest rates on car loans. Fortunately, homeowners have largely used fixed-rate mortgages to purchase their homes over the past decade, so their ability to pay the mortgage will not be directly threatened by a rise in the Fed Funds rate. However, the Fed’s campaign will slow down future activity in the real estate sector because it will increase the cost of real estate purchase and development, which are highly-leveraged activities. The Fed is swinging a blunt instrument, and if history is any guide, it will keep swinging until it succeeds in getting what it wants, which is a lower level of economic activity from the borrowers it targets.